1. Which statement is true when VTP is configured on a switched network that incorporates VLANs? Refer to the exhibit. What information can be learned from the output provided? 4. A network administrator is replacing a failed switch with a switch that was previously on the network. 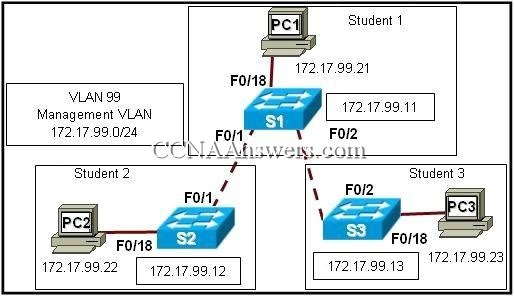 What precautionary step should the administrator take on the replacement switch to avoid incorrect VLAN information from propagating through the network? 7. What does a client mode switch in a VTP management domain do when it receives a summary advertisement with a revision number higher than its current revision number? Refer to the exhibit. All switches in the network participate in the same VTP domain. What happens when the new switch SW2 with a default configuration and revision number of 0 is inserted in the existing VTP domain Lab_Network? Refer to the exhibit. 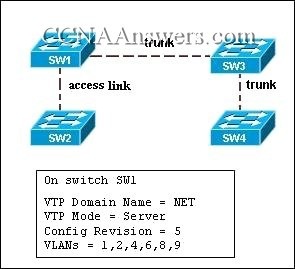 Switches SW1 and SW2 are interconnected via a trunk link but failed to exchange VLAN information. The network administrator issued the show vtp status command to troubleshoot the problem. On the basis of the provided command output, what could be done to correct the problem? Refer to the exhibit. All switches in the VTP domain are new. Switch SW1 is configured as a VTP server, switches SW2 and SW4 are configured as VTP clients, and switch SW3 is configured in VTP transparent mode. Which switch or switches receive VTP updates and synchronize their VLAN configuration based on those updates? Refer to the exhibit. Switch S1 is in VTP server mode. Switches S2 and S3 are in client mode. An administrator accidentally disconnects the cable from F0/1 on S2. What will the effect be on S2? S2 will retain the VLANs as of the latest known revision. 14. 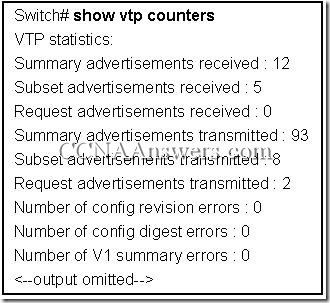 What causes a VTP configured switch to issue a summary advertisement? 15. How are VTP messages sent between switches in a domain? Refer to the exhibit. The switches in the exhibit are connected with trunks within the same VTP management domain. Each switch is labeled with its VTP mode. A new VLAN is added to Switch3. This VLAN does not show up on the other switches. What is the reason for this? 19. What statement describes the default propagation of VLANs on a trunked link? Refer to the exhibit. S2 was previously used in a lab environment and has been added to the production network in server mode. The lab and production networks use the same VTP domain name, so the network administrator made no configuration changes to S2 before adding it to the production network. The lab domain has a higher revision number. After S2 was added to the production network, many computers lost network connectivity. What will solve the problem? Re-enter all appropriate VLANs, except VLAN 1, manually on Switch1 so that they propagate throughout the network.